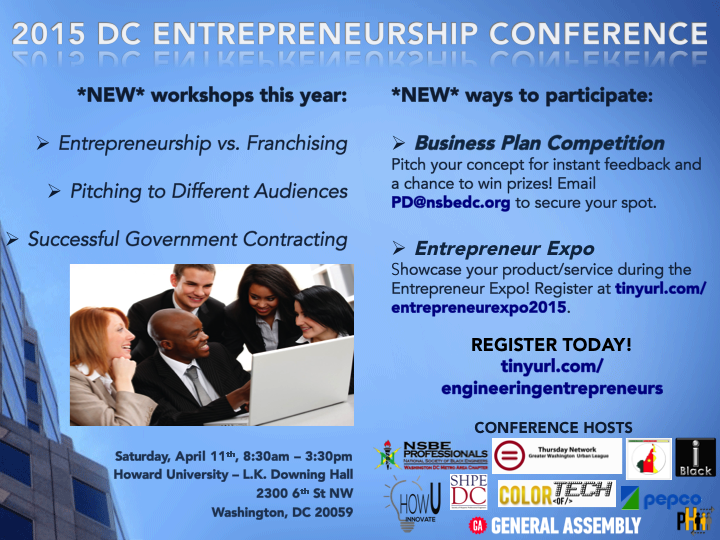 Showcase your product/service during the 2015 DC Entrepreneurship Conference! Setup: The Entrepreneur Expo will begin at 2:00pm (room number TBD). Expo tables should be staged by 1:30pm, and setup can begin as early as 8:30am. Expo table can begin closing at 3:30pm. Tables and chairs will be provided by the facility. Electrical outlets and Wi-Fi is not guaranteed. Please contact PD@nsbedc.org for more information.